A few commands that would be useful unless they already exist. Show firing arcs or los arcs or order firing or observing in a set direction or arc... I guess this does not matter as much b cause los is currently determined as given in a 360 degree arc even for tanks and trucks? This command could also stop infantry from engaging tanks without having at weapons. Although I suppose they do that now? An entrench command for infantry. Over time they dig fox holes if enough time is given. Command for artillery to fire in a line rather than st single units. Especially good for deploying smoke. Command for engagement range to fire at unless fired upon. Currently the micro is either on or off for that stuff. I guess the correct way to use basookas is to turn everything else off except the st weapon. A command to asks units to advance at the same speed as each other. Again losing units because they all advance according to their own maximum speed is annoying. Also they grouped units will not stay in the formation you put them in. An order that allows you to stop a bomber from evacuating as soon as it drops without it being the default behaviour. I need it sometimes but not always. A command to not shoot bailed out vehicles. I have always wondered if I could occupy abandoned enemy vehicles with supply trucks. A command which shows me what infantry are in my trucks before I unload them. A command to leave empty trucks on the field so I can use them to pull artillery. Combine this with not allowing lorries to spot at all or for enemy to bother shooting them unless ordered to???? A command to show armour penetration at different ranges. Maybe combined with the C distance range command. Tie that to units. A fire and and movement command for infantry. So they leapfrog. An auto retreat command for the scout aircraft upon encountering enemy fighters. Re: A few commands that would be useful unless they already exist. I would like to have an "ambush armour" button. Basically, units with HEAT weapons would go into return fire only mode, except for when it comes to attacking armour with their hand held AT. The way it is now, the only real solution for tank ambushes (so they dont give up their location attacking infantry) is to select hold fire until they are close, or manually toggle non AT weapons off, which will get you in trouble if infantry spots you first. Too much micromanaging for a big part of the game that could be solved with a button. Some really good ideas. Some of these could be defaults rather than commands. Select the guard (often a command unit) and right click on the unit you want to follow. Thanks for the guard tip. Is it in the manual or tutorial? Will units guard from in front or behind? As for Winchester evacuate you will notice I specifically did not want it as a default but an option. Works on everything up to long range howitzers. Would really have loved this for the ADATS in Wargame tbh. That'd be handy, though with how spotty smoke deployment is I'm not sure how effective it would be. Eh, this seems like something that would add extra UI clutter when conducting ambushes should be up to player skill. Just turn off the rifles on bazooka squads, yes. This is why I hated Highway in Wargame; the reinforcement routes for some locations were awful and led to many pointless unit deaths. You should be able to just set a rally point for reinforcements that they travel to before going to their destination so you can direct them to a safer road. Been asked for since forever; astounding that it's not in a game yet tbh. Fighter planes automatically engage enemy planes near them. To accelerate this I suggest putting all your fighters on the same hotkey every game so you can just select them with, say, the "3" key and click in the direction of the air warning on the minimap. This is better than giving your enemy an opportunity to bait unit AI logic into a trap with this suggestion. As others have said, Evac Winchester in the settings. If you want to emulate Evac Winchester after you turn it off, hold down shift after you give the bomber its attack order and then press your evac hotkey, which will queue up an evac order to trigger immediately after the attack is made; otherwise, it will go on an idle pattern like fighters do. Another UI clutter element I don't really see the necessity of when you can just... tell them to go to the supply truck. You cannot, and both sides were trained to shoot an enemy tank until it caught fire or changed in shape, so this behavior from your units is realistic. Think of the Bail Out crit as representing some internal damage to the vehicle that has made it unserviceable, and so the crew abandons it, but outwardly it still looks like a tank to your units. Edit: Also this isn't Company of Heroes where your rear echelon support units know how to drive a Tiger tank. Not even a command here, just a UI improvement that lets us see that in the first place, like damn. And in the meantime, why don't 1st Infantry assault breachers have the TNT thrower icon so that you can tell them apart from assault MGs?? Nah the reduction in battlefield clutter from disappearing trucks I think is a good thing. You'd have to pay for trucks in the unit cost if they stayed on the field and realistically we're already deliberately sending prime movers way closer to live bullets than ever would have been done in real life. The increased mobility is one of the things highly mechanized divisions pay for with their transport cost. You can still move artillery with supply trucks. Perhaps a modder could add a "+X" value at each range increment on the LOS tool to help you quickly calculate this yourself. I don't know if that's possible. Scouts that encounter enemy fighters are already dead. For the sturdier ones, their only hope is to turn head-on into their attacker and then evac as the enemy flies past to try to buy time for friendly fighters to catch up, and all that has to be done manually. Mister Maf. Appreciate the reply. A good one. However when I say that I want max range. I mean I want the indicator to show what the max range is of my weapon. 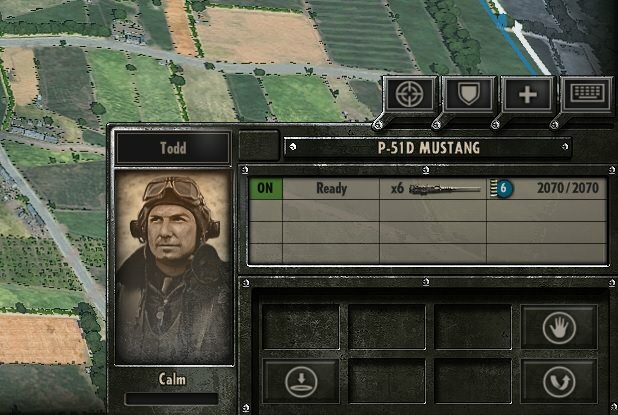 THe range indicator currently shows distance but expects you to remember the max range of your gun for each unit. I generally do. But it would be nice just to see how far you need to go to get into range at a glance for each weapon... main, secondary and special. Of course max range does not mean you will penetrate. It was just a nice to have sort of wish. Not critical. I'd even love to have C come on each time I select a unit instead of having to shortcut all the time. A lot of what you mention below I would not call player skill if you are focused somewhere else on the map and 10 things are happening at once. That's more frantic keyboard and awareness skills rather than tactical or strategic skill. Realistically commanders do not have to or should not have to give their men orders after issueing SOPs or rules of engagement tactics of the day etc before a battle. Hell you could introduce a mechanic where veterans will micro themselves and rookie infantry will not. But then without player interactions such as these what exactly would one do in a game like this? That is what I have combat mission fortress italy for. Most of my suggestions are aimed at removing a situation where the player cannot be in 10 places at once micro managing each and every engagement. Because then the winner tends to be the one who can do 10 things at once hectically rather than the one that makes informed considered dicisions. If you look closely at the screenshot, you will see that only the 600m ring is highlighted, because the gun range on the AVRE is 600m. This is unique to this particular UI button which unfortunately does not have a hotkey but absolutely should. If you use it on howitzers, it will show a very large ring well past the normal 1200m edge. As for the rest, I guess it comes down to how much granularity Eugen wants to add to this decidedly not milsim game. I find control groups and hotkeys resolve most of the unit behavior-related problems presented here and I don't really consider myself particularly amazing at the game or RTS in general. Since Eugen's quality of life additions to each game are very incremental, I'd rather focus on the most important ones. Disabling evac winchester by default just adds a lot of unnecessary busy work. you need to press 2 more buttons every time to call in aircraft to do what it is doing by default just so you can have the opportunity to sometimes not do it. there is enough ui space to simply add a button that disables evac winchester for one sortie. Mister Maf wrote: If you look closely at the screenshot, you will see that only the 600m ring is highlighted, because the gun range on the AVRE is 600m. This is unique to this particular UI button which unfortunately does not have a hotkey but absolutely should. If you use it on howitzers, it will show a very large ring well past the normal 1200m edge. As for the rest, I guess it comes down to how much granularity Eugen wants to add to this decidedly not milsim game. I find control groups and hotkeys resolve most of the unit behavior-related problems presented here and I don't really consider myself particularly amazing at the game or RTS in general. Since Eugen's quality of life additions to each game are very incremental, I'd rather focus on the most important ones. Fair enough. I do see the ring. That looks like the normal C hotkey? I was not aware of another range button or shortcut. I guess perhaps the range button in the UI ties the range indicator to the unit rather than simply to the field. Something to try once again. Thank you. Bet that was not in the manual either! P.S. Just tried it and you can leave the eye button to on for the whole game and it shows anytime you select a unit without fail. Going to leave this on next time and see how annoying it gets not being able to see adjacent units.